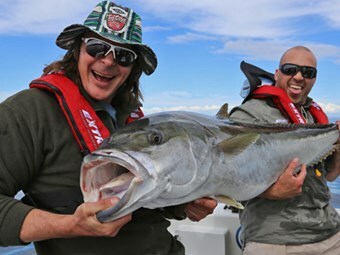 PlaceMakers Big Angry Fish is one of the highest rating fishing shows on TV, and now it is back with a new season of amazing shallow water fishing on TV3 at 5.30pm on Sundays from 27 July 2014. Milan and Nathan are back. It is a common perception that large fish are only found far off shore, but the TV series prove just the opposite. The New Zealand mangroves, harbours and coastline make great destinations for the anglers who thrive on hearing their fishing reel screaming while line is being peeled off by a big angry fish. During the thirteen new episodes, hosts Milan and Nathan visit these less explored fishing grounds and beautiful sceneries on the hunt for trophy fish. In attempts to lure in the fish, Milan and Nathan make use of not only the usual fishing methods, but they also experiment with Nathan’s new fishing inventions and saltwater fly fishing. As always, the fishing imposes challenges for the two anglers but during the season, a generous amount of big angry fish will be both caught and released. The focus of the TV series is to share the excitement of being out on the water fishing, having fun and staying safe doing it. During each episode, Milan and Nathan will explain how they find their fishing spots, when they go there, and what techniques they apply in hope of hooking up some trophy fish. This season, the viewers can be looking forward to quality filming from the air, on land and sea, and underwater while venturing out for feisty harbour kingfish, bronze whaler sharks, blue ocean hapuka and fly fishing for snapper. As a grand finale of the third season, the TV series debut with tree hour-long episodes focused on kayak fishing, island exploring and a revisit to the waters surrounding Northland, which holds Milan and Nathan’s favourite fishing grounds.